Housing starts in December were at a seasonally adjusted annual rate of 999,000, according to estimates from the Census Bureau and Department of Housing and Urban Development. In addition, the November level was revised up by 1.5% to a 1,107,000 annualized rate. As a result, the December reading was 9.8% below this revised November estimate, but 1.6% above the pace of housing starts recorded in December 2012. Despite the month-over-month decline, housing production ended the year in a relatively strong fashion. The annualized rate of housing starts recorded in December exceeded the level recorded for all of 2013, 923,000, by 8.2%. The December recording of total housing starts was also the third highest level in 2013 behind the 1.1 million starts recorded in November and 1 million starts registered in March. Moreover, on a 3-month moving average basis, one method used to identify an underlying trend, housing starts rose by 4.4% in December, eclipsing 1million for the first time in 2013. 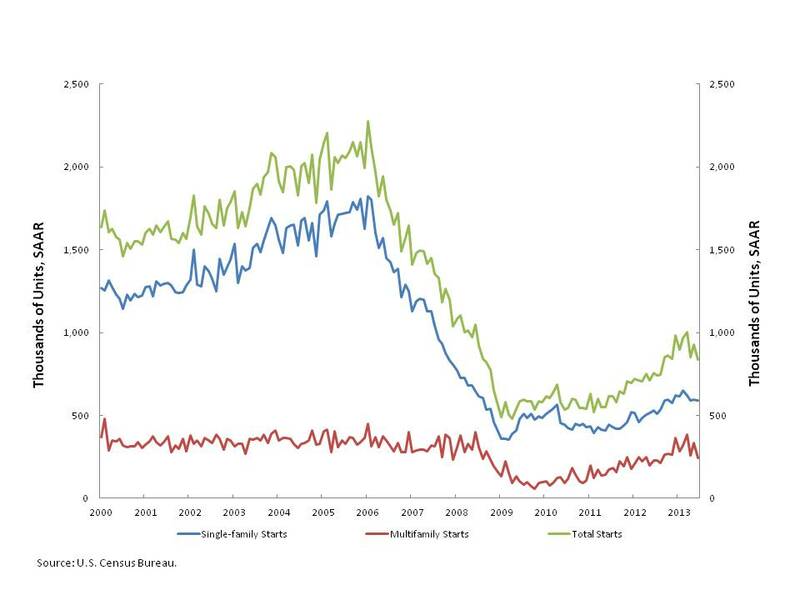 The 3-month moving average of total housing starts last exceeded 1million in June 2008. The Census estimates for 2013 demonstrate it was a positive one for home building. Total housing starts are estimated to come in at 923,000, 18% higher than 2012. Multifamily starts are estimated to total 306,000, a nearly 25% jump over 2012. 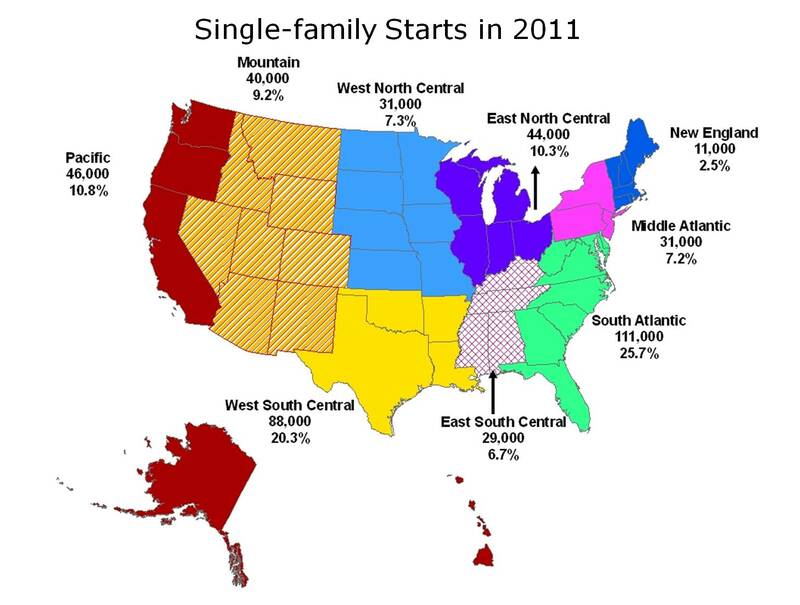 And single-family starts grew 15% over 2012 to 618,000. Going forward, housing starts should continue to show progress as pent-up demand is unlocked and the labor market improves. The NAHB/Wells Fargo Housing Market Index is consistent with this forecast, coming in a level of 56 in January – the eighth consecutive month above the key level of 50. The Census Bureau reported on building permits, but the housing starts data has been delayed until December 18 due to the partial federal government shutdown in early October. The pace of building permit issuance rose to a seasonally adjusted annual rate of 974 thousand in September and rose again to 1,034 thousand annually in October. The pace of August permitting was revised up to 926 thousand annually. Single family permitting continued its steady progress at a pace of 620 thousand annually in October, but the strength in today’s report was concentrated in the multifamily sector where permitting surged to 414 thousand units annually. That’s according to the permits data (issued by local jurisdictions) but it’s worth noting that the composition of activity is likely to change when we see the actual starts data in December. The single family starts are likely to reflect stronger growth than seen in the permits data because building in non-permit issuing areas is included in the starts data, and some permits are reclassified from multifamily to single family when started. The reclassifications occur when local jurisdictions define some configurations multifamily (e.g., townhouses) but the Census Bureau treats them as single family. These reclassifications boost single family starts relative to permits and depress multifamily starts relative to permits. Overall, today’s report is a positive signal that the government shutdown and the uncertainty surrounding the ongoing negotiations to keep the government running have not yet taken a toll on the housing market recovery, but we’ll see how much of that strength is sustained in December’s housing starts report and in the months ahead. The U.S. Census Bureau reported that housing starts were at a seasonally adjusted annual rate of 836,000 for June, a 9.9% slower pace than May but 10.4% higher than one year ago. 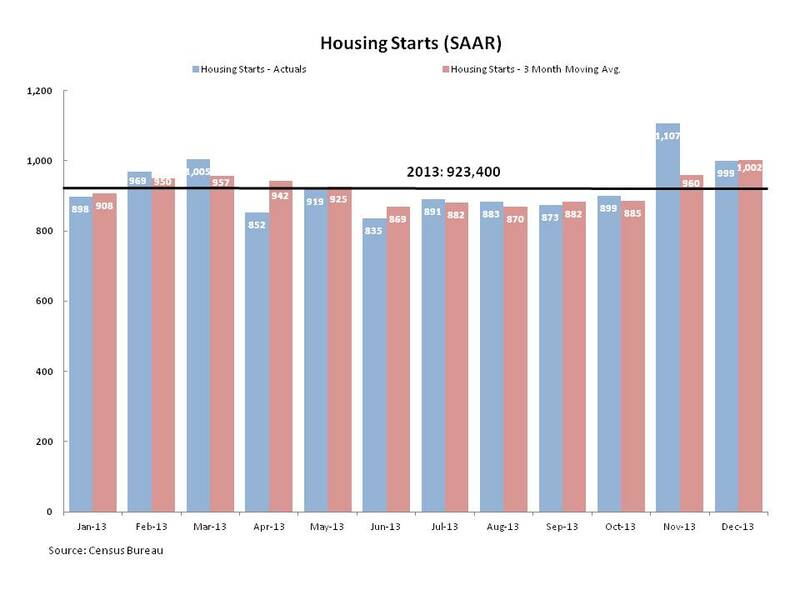 The month-over-month decline in housing starts largely reflected a 26.2% decrease in multifamily starts, which came in at a seasonally adjusted annual rate of 245,000 in June. Single-family housing starts, which accounted for 71% of all housing starts in June, were generally flat. Between May and June single-family starts fell by 0.8% to a seasonally adjusted annual rate of 591,000. Over the past twelve months, single-family housing starts are up 11.5%. Multifamily housing starts typically experience month-to-month volatility. On a 3-month moving average basis, which smoothes the volatility, multifamily housing starts have been generally declining since March, with the three month moving average having fallen by 15.0% over the period. Going forward, single-family starts should continue to grow, consistent with the recent rise in the NAHB/Wells Fargo Housing Market Index, a measure of single-family builder confidence. NAHB forecasts that single-family construction will be up 20% for 2013. Future data will provide a clearer picture of the growth prospects of the multifamily sector. 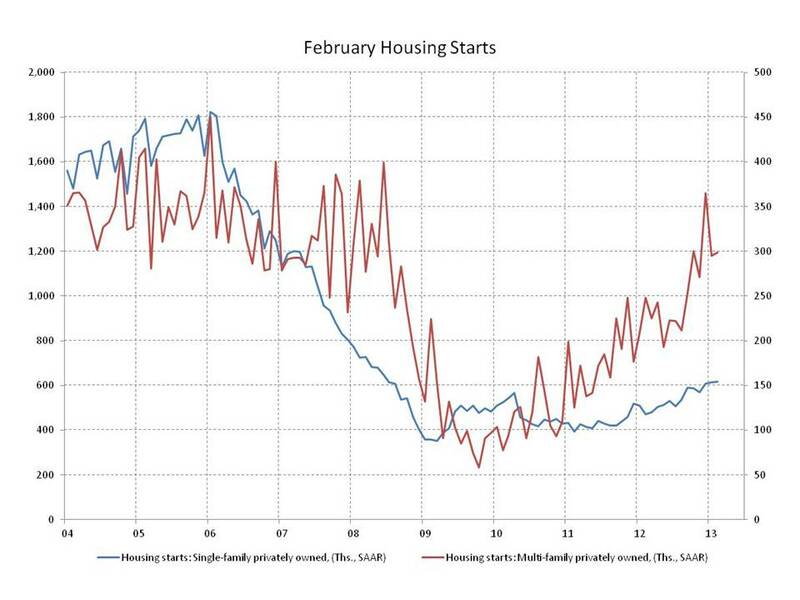 Housing starts for February came in at a healthy pace for both single and multifamily units. Single family housing starts in February ran at a 618 thousand annual pace (SAAR) while multifamily starts came in at 299 thousand. This represents a continuation of the solid growth trajectory in single family starts that began in earnest in late 2011 and carried through 2012. Multifamily starts tend to be more volatile but have trended upward since hitting bottom in late 2009 and have outpaced single family production in the housing market recovery. Issuance of new building permits is on track to sustain the current levels of production and we expect going forward that the pace of single family production will accelerate approaching 1 million single family starts by the end of 2014. We expect multifamily starts to continue to increase but at a slower pace than the 200+ percent growth rate in the fourth quarter as starts move steadily toward the annual pace of 350 thousand that we consider sustainable. Traditionally, the Census Bureau reports statistics on new residential construction (including housing starts) only for the four principal census regions: Northeast, Midwest, South and West. The geography is limited by the way the sample for the Survey of Construction is drawn. In 2009, the sample was redrawn in a way that allows for slightly more geographic detail (i.e., nine census divisions). Although the added detail isn’t yet published on the Census website, it can be tabulated from a publicly available data set. The public data set for residential construction in 2011 was released in June of this year. It shows that more than one in four single-family starts occurred in the South Atlantic—a division that includes a strip of seven states on the east coast, stretching from Delaware to Florida—plus West Virginia and the District of Columbia. 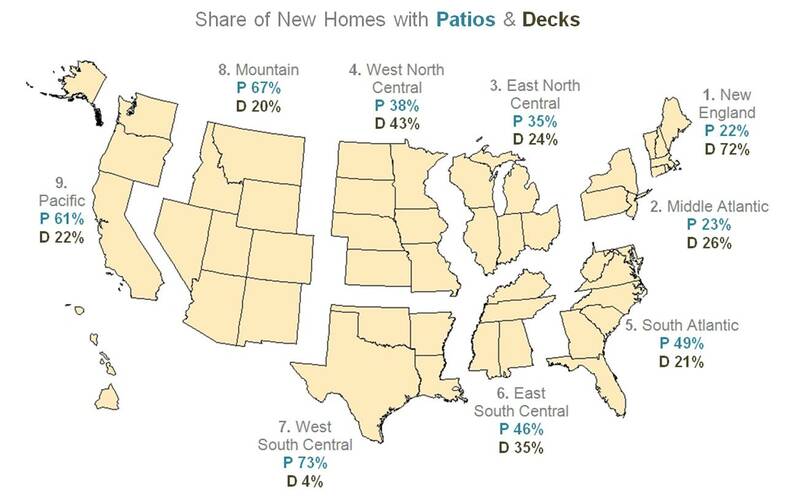 Second is the West South Central Division (Arkansas, Louisiana, Oklahoma and Texas) with just over 20 percent. Each of the other seven divisions accounted for less than 11 percent of single-family starts. Since 2009, the South Atlantic increased its share of single-family starts from 23.1 to 25.7 percent, and the share also incresed in the Middle Atlantic (from 6.7 to 7.2 percent) and West North Central (6.7 to 7.3 percent). The starts share in the other six divisions was either close to unchanged or down slightly from 2009, the last time NAHB published an article showing a division breakdown. Historically, 2009 and 2011 were unusual in that fewer than 450,000 single-family homes were started in each of those years. In comparison, from 1960 through 2007 single-family starts averaged about 1.1 million per year. Caution is therefore required when interpreting recent statistics. When such a large share of construction activity has disappeared, the current distribution of starts may be capturing a temporary effect (i.e., areas that were better able than others to resist the downturn) as well as longer-run geographic trends.